Colour coating is a term used to describe the application of a decorative and/or protective organic coating to steel substrate supplied in coil form. Colour coated steel is also called as pre-painted steel. Colour coatings are paint coatings and are specialty products, which are used to give the steel a long term protection under a broad range of corrosive conditions, extending from atmospheric exposure to full immersion in strongly corrosive solutions. A colour coating provides little strength to the substrate steel, yet it protects the steel so that its strength and integrity can be maintained. Colour coating of steel is a continuous and highly automated industrial process for efficiently coating of coils of steel. In this process of application of colour coating, the substrate steel gets protective and decorative coating. This process of colour coating is also called a duplex coating. The process of colour coating of steel according to EN 10169:2010 is a ‘process in which an organic coating material is applied on rolled metal strip in a continuous process which includes cleaning, if necessary, and chemical pre-treatment of the metal surface and either one side or two side, single or multiple application of (liquid) paints or coating powders which are subsequently cured or / and laminating with permanent plastic films’. The first colour coating line was started in Europe during 1940s. It became immediately very popular due to its basic inherent advantages which are given below. Colour coating usually refers to the application of liquid paint coat over the substrate in an automatic, continuous process after pre-treatment. The pre-painted colour coated steel is a very high value-added product that combines the best properties of both substrate and organic coating, additionally imparting it an aesthetic finish, high degree of durability and high corrosion resistance. The thickness of colour coating is usually in the range of 15 microns to 40 microns and the finishes are smooth, matt, high gloss, textures and printed. For standard colour coated sheet, the thickness of substrate steel usually varies from 0.2 mm to 1.6 mm and width varies from 600 mm to 1600 mm. Colour coating is done on various substrates of steels to produce most cost effective, quality assured products with the top coat compatible with environment. The substrate steels normally used are given below. Galvalume – It is also known as Zincalume and consists of 55 % aluminum, 43.5 % zinc and 1.5 % silicon by weight. The colour coating line processes both cold rolled and metal coated steel coils. The continuous colour coating line starts by uncoiling the coil to be processed and mechanically joining the head end of the strip to the tail end of the previous coil. Due to the continuous operation, the line includes two strip accumulators, which feed the strip to the coating process during coil changes. As the first step of producing such material, pre treatment is carried out to ensure a uniform and clean substrate surface. Pre treatment of the substrate is a very important operation required for better adhesion formability of colour coated steel sheets. Subsequently, the surface is activated by means of chromate free conversion to ensure good corrosion protection and adhesiveness of the following prime coating. This can be applied either to the top and/or bottom surface. Before entering the next process step, the strip must be dried uniformly. Some colour coated producers uses ‘no rinse’ technology in place of phosphating (phosphate coating) over the substrate steel strip because of better bath maintenance, uniform crystal structure of coating as well as to meet the demand of end users for more flexibility of coated steel. No rinse coating pre treatment is a very thin layer of chemical treatment that bonds the coating surface of steel to the subsequently applied organic coating materials to ensure excellent adhesion of the organic coating material and corrosion resistance of the steel substrate. In case of the chemical pre treatment, the strip surface is washed and a passivation layer is added in four phases. The passivation layer improves the corrosion resistance of the product and adhesion of the primer. After the pretreatment, the primer of uniform layer of uniformly controlled thickness is applied on the pre treated surface. The primer provides flexibility to the colour coating system as well as corrosion resistance since it contains corrosion inhibitors. The primer is cured in the oven with precise temperature controls and with great precision. Different types of primers are available based on various resins such as epoxy, polyester, polyurethane and PVC (Polyvinyl chloride). Epoxy primers are preferred for use in roofing as it contains chromate pigments for better corrosion resistance. Hexavalent chromium (chromium VI) serves electrochemical couplers that can resist the corrosive action on most metal surface. However, these compounds are widely used in industrial coatings, are classified as ‘carcinogens’ (category 1 and 2) as well being toxic and dangerous to environment. Hence some producers have developed chromate free primers. The colour coating line has normally two coaters. The first one applies the primer on both sides of the strip and the second one applies the top coat and the backing coat. After the two coaters, there are convection ovens, where the colour coatings are cured by hot air. Most of the roofing and construction markets for colour coated sheets use top coats which are based on polyester, Polyurethane (PU), fluorocarbon, polyvinylidene fluoride (PVDF), silicone modified polyester (SMP) and plastisols for cost effectiveness and durability. The top coat contains a combination of colour pigments and additives which provides the required colour and other performance properties like ultra violet resistance etc. After the ovens, the painted strip is quenched in water. If laminate is applied as the top coating, the latter coater applies adhesive that is activated in the oven. A laminate film is pressed on the steel strip by a roll immediately once the product has left the oven. A protective film may also be applied onto the coating, which will protect the coating from damage and dirt during subsequent processing by the customer. Before coiling the strip’s surface is checked visually. A sample cut from the strip undergoes quality control in the laboratory of the colour coating line. Before final cooling, a device can be installed for applying a protective foil to the hot surface, depending on customers’ requirements. 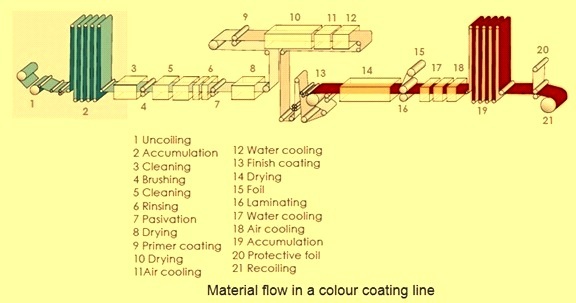 A typical colour coating line showing the material flow is shown in Fig 2. Impact test – This test is conducted to determine the resistance of the colour coating to the mechanical damage. It is carried out by the falling weight test as per the ASTM D 2774-84 standards. This method is used to check for cracking or loss of adhesion at areas other than the impact area. For the test the sample is fixed at the bottom of the equipment with the help of two fixtures. According to the above standard weight of 4.76 kg +/- 28 gm is allowed to fall freely from a height of 57 cm. Bending adhesion test – The bending adhesion test is carried out as per ASTM D4145-83, for assessing the adhesion of coating films to the steel substrates. During the test a 180 degree bend is made by applying force in a bending machine. The sample is folded to twice the thickness (2t) of the substrate for assessing adherence of the colour coating. If it fails after 2t bend then it is considered as a bending adherence test failure. Flexibility test – The flexibility test is carried out as per ASTM D522 standard. It is used to determine the flexibility resistance to cracking of colour coating on the steel sheet substrate. A conical mandrel is used for the test. The coated steel sheet sample is bent over the mandrel through 180 degree in one second. Subsequent to bending, the colour coating film is examined for cracking and delamination from the steel substrate. Hardness test – This is also known as pencil test and though this test the hardness of the colour coating is determined to assess mechanical damage. This test is done as per the standard ASTM D 3363-74. This method is used to check the hardness. The sample is fixed at the bottom of the equipment with the help of two fixtures. According to this standard, the second roll specified high hardness is 2H minimum. For this test faber castle pencil is used. Chemical resistance test – The chemical resistance of the colour coating is evaluated by immersing the colour coated s in distilled water, 5 % aqueous solution of NaOH, and 5 % aqueous solution of H2SO4 solution for 24 hours. Samples are evaluated for evidence of detrimental chemical attack. Evaluations of samples generally indicate variation in gloss, color and adhesion. Monitoring of problems like blistering, disbondment, chalking and cracking is done through this test. Salt spray test – This test is conducted according to ASTM standard B117 to judge the performance of colour coating in the marine environment containing salt. During this test the colour coating sample is exposed to salt spray fog in a customized sealed chamber. 5% of NaCl salt solution is taken as the standard to generate the salt spray. Other parameters like temperature, air pressure, orientation of the sample etc. are maintained. The progress of corrosion is evaluated by visual examination after a given interval. Heat resistance test – For this test standard size of sample is kept inside the muffle electrical furnace for 12 hours at a temperature of 1250 deg C. Every hour the sample is taken out for inspection and is observed for blistering, change of color and gloss. MEK (methyl ethyl ketone) test – For this test, cotton wool is soaked in MEK solution. 1 Kg load is applied on the sample and the sample is rubbed by cotton wool up by thumb for 100 times. Cotton wool is re-soaked in the MEK solution after every 25 rubs. The sample is observed for colour coating getting peel off. 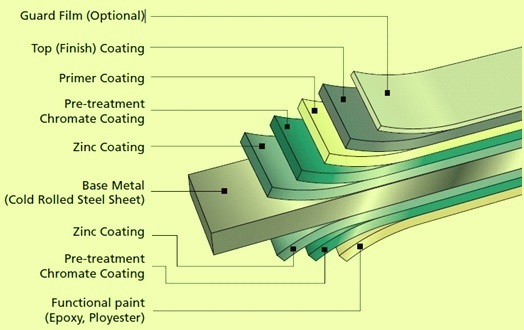 The applications of the colour coated steel include the following. White goods (appliances) such as refrigerators, deep freezers, washing machines etc. Bus bodies, railway coaches and luxury coaches etc.